Heather is usually on the attacking end of Conquer the Castle, so Selkie may have a fair shot. In the first draft of this sequence, Heather and Selkie were playing a co-op video game together. I changed it to an outdoor activity because it felt like I was forcing my own interests on Heather and Selkie. Heather doesn't strike me as the kind of kid who likes video games much. doesn’t selkie have improbable aiming, like when she helped moonsong? If anything, Heather would probably play some Wii games… but only on rainy days. Ha ha! She didn’t mention the cricket bat. …there’s a cricket bat, right? And black- the colours of Glamorgan Cricket Club. Huzzah! P.S. I’m a Simon Pegg fan too! That’s the price to pay for being an awesome goalie. Perhaps with her brand new shoes Selkie will have a better chance to do well? Hopefully Selkie remembers she’ll have to flush her gills. I wonder if this will let Heather know somehow that she took Selkie’s shirt while she was trying to BREATHE? I guess the only sport Selkie would like would be swimming. Is there a swim team at her school? On the other hand, the chlorine might be horrible for her. It would kill a fish. Though she seems to handle the chemicals in tap water well enough. She can drink it a little, I think, but she can’t flush her gills with it. Looks like Heather’s enthusiasm is catching. First three panels:”What’s out here” (I am so bored). “A shed? Really?” (whoopie do, golly gee, a shed, how exciting). “Soccer? Yuck, no” (I’m not going to play that stupid game – it hurts my feet). 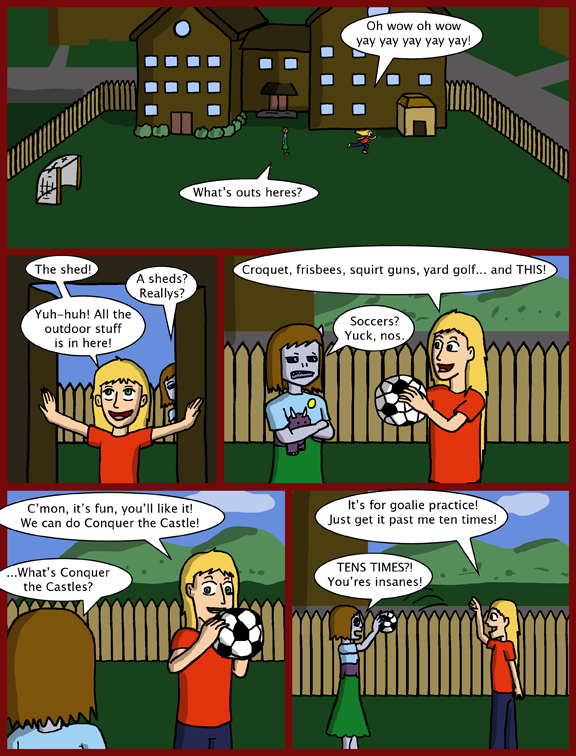 Fourth panel: “What’s Conquer the Castle?” (That sounds kind of interesting). I think Heather got her. Well, playing “Kick the Ball at the Bully” has a certain appeal. I think it’s mostly because she knows how good Heather is at soccer and thinks its impossible. I’m not saying Selkie can’t beat her but I can see her skills bringing them closer together with her skills. Her gills will probably dry out too and Heather will run in to get help or get her some water. Well, I think they’ll begin to get along. I still think they should have a heart to heart but since they’re children. it would also work that they just bond at this dinner and become friends. I just hope Heather won’t get stuck in the trap of being mean so she can win Amanda back. Amanda is totally the kind of child who would say “Well, if you want to be my friend again, then you have to be mean to Selkie.” Which incidentally, could make Keisha dump Amanda and decide to be nice to Selkie. She did think that taking the T-shirt was bad. Keisha and Heather should definitely become friends with Selkie, it seems like they would. Also, on the thing of them playing videogames instead of going outside, when Heather was listing what she was grounded from, it seemed a lot like she really didn’t like being stuck inside. So either you had re-planned this back then, or you’ve switched to something that also makes more sense from canon perspective. I switched from video games to soccer before this house visit story even began. 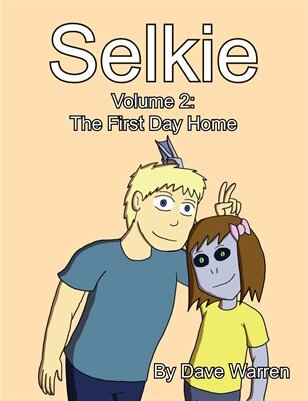 What happens when someone introduces Selkie to the Cthulhu Mythos?